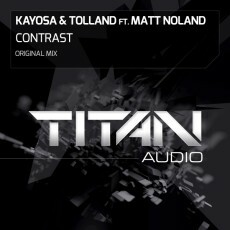 Fresh from their recent string of releases on FSOE and Monster, production outfit Kayosa & Tolland return to the Titan Audio imprint, this time bringing on board the talents of newcomer, Matt Noland. Contrast, is a highly polished slice of UK Trance, showcasing a fusion of melodic elements, tough beats and warm bass, encapsulating the Titan Audio ethos perfectly. No-nonsense Trance as expected from Kayosa & Tolland.